Facebook Custom Audiences is a powerful advertising tool to increase your company’s sales. Find out what they are and how they can be effectively integrated with your Wi-Fi user data to help you generate new conversions. If you are a B2B company looking for an effective way to increase the number of your customers and sales, Facebook custom audiences based on your social Wi-Fi user data are the right option (even if it’s quite expensive). When offering free Wi-Fi to your clients, by allowing them to log in using their favorite social network, you can capture useful user information – i.e. emails, phone numbers, Facebook details – and leverage it in a smart way through Custom Audiences, the powerful tool provided by Facebook to target the right people with your advertising. 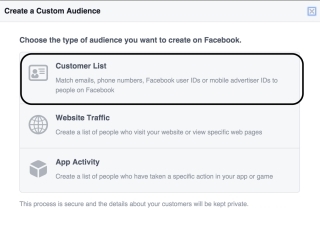 Facebook Custom audiences allows you to re-target ‘warm users’, a list of potential clients you already have some personal information about, and who already had an experience with your brand and your products/services. By offering free Wi-Fi on your hotspots, you can engage your customers while using your Wi-Fi making them more likely to appreciate the discounts and offers promoted on your authentication page. Not to mention, this will encourage them to find out more about your products/services, and interact with the brand on social media. In doing so, you will be able collect data of thousands of users while enhancing their experience. As these users already engaged with your brand at least once, there are higher chances that they can convert and become customers. Accordingly, Facebook custom audiences allow you to generate new leads and conversions quicker and at a low cost, taking advantage of the traffic you gathered via Wi-Fi. Here is an example of a B2B business taking advantage of re-targeting. A shoe brand company has 4 stores located in different shopping malls, but also sells through e-commerce. They decide to re-target people that connected to their Wi-Fi while visiting the stores, as a way to promote their Facebook page – where they are temporary offering discounts for their e-commerce channel. Thanks to this, the brand is not promoting its Facebook page to the wrong target, but only to the customers who actually visited a store in the last 30 days and, consequently, are more likely to buy. As a matter of fact, thanks to re-targeting, they can increase their conversion rate from visitor to customer in the e-commerce store by 130%. 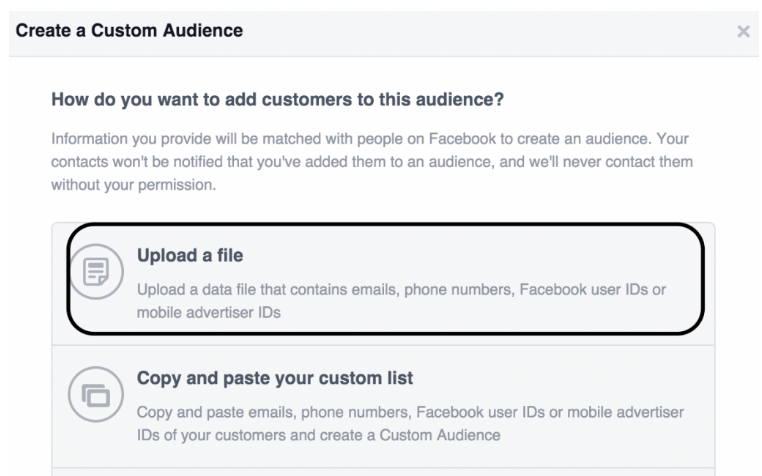 Let’s now see how a Facebook Custom Audience works. 1. 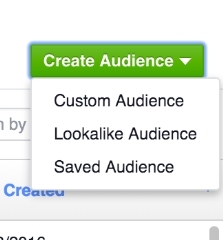 Go to your Facebook Power Editor/ Ads Manager, select “Audiences” and go to “Create Audience”. 2. Among the three available options – Custom Audience, Lookalike Audience and Saved Audience – choose “Custom Audience”. 3. Click on “Customer List”, the standard type of custom audience you want to create among the available options. In general, Facebook effectively matches around 60-80% of the contacts of your list. 4. You can now arrange a file based on your users’ collected information. For instance, you can export your list in CSV from the Tanaza Dashboard, the user-friendly analytics tool that allows you to collect the data captured through Wi-Fi. The Dashboard designed by Tanaza makes analytics very intuitive and enables you to filter your user data according to different parameters, such as users’ age, gender, location and date of registration i.e. segment women registered through Facebook in January 2017, coming from Indonesia, between 18 and 25 yrs old. 5. You can now upload your Wi-Fi users’ files. Lastly, you can add a name and a description of your custom audience list so as to easily find it anytime (such as “Female Wi-Fi users registered in January 2017”). Custom audiences can be used for many reasons and segmented depending on your goals: for instance, you can start a Facebook campaign based on your custom audience list as a way to increase the number of Likes on your Facebook page and improve your social reach. Furthermore, you can re-target clients who already bought your products/services in the past with personalized offers, segmenting your custom audience list with the contacts of not-regular customers. This is particularly relevant, considering the huge impact of repeat customers on total revenue – according to Social Annex’ 2016 most important customer loyalty statistics: “1% of a retail website’s users generate as much as 40% of its revenue”. In order to collect a large amount of information about your Wi-Fi clients in a quick and easy way, you can rely on Tanaza, the all-in-one software for social hotspots, data capture and analytics. With Tanaza, you can download your Wi-Fi user data to a csv file, which you will use to create your personalised Facebook custom audience. To conclude, by leveraging your social Wi-Fi user data with Facebook custom audiences, companies can boost their sales in many different ways and quickly. IMAGE SOURCE: Digital Marketing Lab.